The annual White Coat Ceremony is a relatively new tradition at medical schools across the country. In order to convey the virtues of the profession - compassion, altruism, duty, honor, respect, and responsibility - Dr. Arnold P. Gold created the event. The first White Coat Ceremony was held at the Columbia University College of Physicians and Surgeons in New York in 1993. Dr. Gold believed that students should declare their commitment to the profession and the virtues therein at the beginning of their medical school journey, rather than at the end. Now, 97% of medical schools have a White Coat Ceremony. The Ceremony gives a clear set of guidelines for these doctors-in-training to follow, and students are able to accept the obligations of the profession and commit to upholding the high standards that come with the title of "doctor". 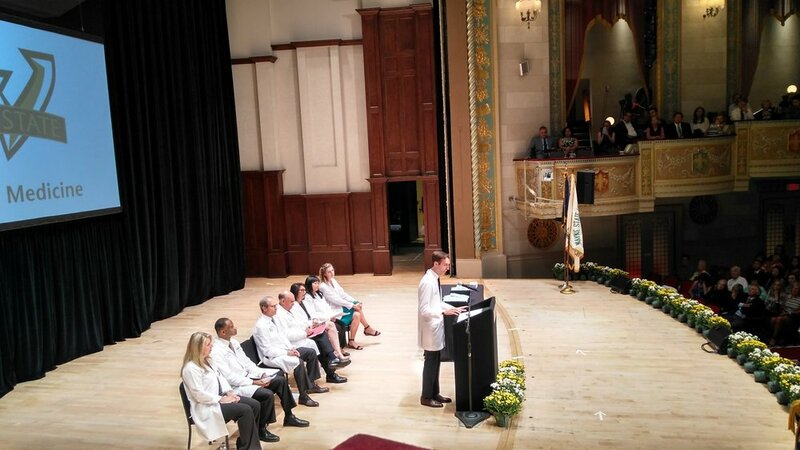 First of all, it was a tremendous honor to be selected as the Keynote Speaker for the Wayne State University School of Medicine White Coat Ceremony for the Class of 2021. When I received the phone call to be the speaker, I was nearly speechless and unsure of my ability to live up to the expectations that come with this role. I needed 24 hours to think on the offer. After talking it over with my wife, I decided that this was something that I could do, and that I had a lot to say about the opportunity before these students and the medical profession in general. When I was getting ready for medical school, I read several books. I was to be the first doctor in my family and I had a limited perspective on the medical field, i.e. I had no idea what I was getting myself into. One of the authors that stuck with me was Atul Gawande, a surgeon and writer out of Boston. He wrote about the appealing aspects of a career in Medicine: autonomy, complexity, and a direct relationship between effort and reward. However, something was missing. For me, that something is happiness. You see, doctors struggle with professional burnout, substance abuse, and suicide. We can speculate about why, but I think it's some combination of consistent perfection, frustrations with the monolithic systems within health care, and a heavy workload. I didn't want to get into the darker side of these concerns during the White Coat Ceremony, but they definitely influenced my speech. Because of these concerns and these problems in the medical profession, I believe that we need to focus on creating a culture of happiness in the medical field. How can we train doctors to be happy? How can we create hospital systems, clinics, and insurance policies that foster physician wellness and happiness? I don't know if there are great answers to these questions, but it's something that I have thought about deeply. For me, creating a happy practice involved creating a membership model for health care via Plum Health. That works for me, but during my speech, I encouraged these medical students to explore the profession fully and to find their own means of happiness within it. Wayne State University School of Medicine published an official write-up about the event on their webpage, here.